With the 2017 Tucson Gem Show just around the corner, the anticipation and excitement of seeing the worlds beautiful gems is in the air. As I pack my bags for this annual pilgrimage, I reflect back on our 2016 adventure to the Scorpion tsavorite mine in Kenya and to the fabled gemstone town of Idar-Obserstein, Germany. The journey was to follow a gemstone from its birthplace in East Africa, to seeing it being cut first hand by the craftsman in Idar-Oberstein. als began very early, spurred on by specimens that I found at the nearby Mont-St.-Hilaire quarry. I share this fascination that so many of us have, to find an object of natural beauty in the earth and hold it up to the sunlight and see it sparkle. As this statue in Idar-Oberstein’s village square so amply symbolizes, humankind is eternally drawn to the natures natural beauty. The position of Idar-Oberstein today as the worlds premier gem cutting centre began over 600 years ago, when the mechanization of gem cutting was developed to work the agate, quartz and jasper being extracted from the local Hunsruck mountain range. With a growing population of skilled cutters and plentiful supply of rough material, the towns prospered. Since the 15th century, the gems were fashioned using water powered wheels in workshops along the Nahe River. At its peak, there were 56 cutting mills in operation, with the last mill, seen here, the historic Weiherschieife reopening to the public as a museum in 1997. In the 1880’s the agate deposits along the Nahe were being depleted, putting pressure on the local lapidary firms to look elsewhere for their rough supply. Around this time, many Germans, including cutters from Idar-Oberstein, were emigrating abroad due to economic hardships, and Brazil was one destination of choice. The discoveries there of Brazilian agate and other gemstone material resulted in new opportunities, and the export of gem material back to Idar-Oberstein was instrumental in the revival of the their cutting industry. With the advent of electricity in the mid 1800’s, the electric motor began to replace the water powered cutting wheels of the river mills and spurred development of modern cutting equipment. The discovery of diamonds in South Africa became an important source for cutting abrasives and tools for the skilled lapidaries. Throughout the 1900’s, Idar-Oberstein’s prestige as the worlds preeminent gemstone cutting centre was unmatched. the rise of the Far East economies, where products are being produced cheaply and in large quantity to satisfy the world‘s economy. These developments had a negative effect on Idar-Oberstein and during the late 1900‘s and early 2000‘s, the number of cutting houses shrank from 250 to 150. Cutters had to look elsewhere for work, as in the optical industry, and many left the region. 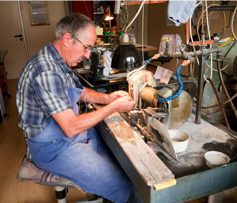 The challenge remains today for Idar-Oberstein to keep its skilled workforce and hard earned position as an economically successful and artistic centre for the lapidary trade. The heavy competition from the Far East has forced many of Idar-Oberstein cutters to shift their focus to larger, premium cut and one of a kind pieces, as well as custom orders. Others are specializing in producing contemporary as well as classic carvings, such as hard stone cameos and intaglios and small figures of abstract and natural inspiration. 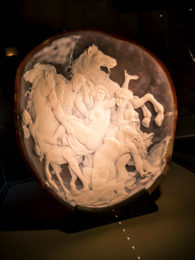 The long tradition of carving agate continues and many fine examples can be viewed at the outstanding Deutsches Edelsteinmuseum or the Museum Idar-Oberstein. eration . Rene‘ Arnoldi is currently passing on his expertise and extensive knowledge of the gemstone industry to his son Alexander. 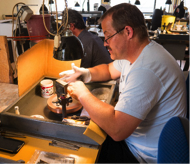 Learning from the ground up, Alexander completed the three year apprenticeship program in gem cutting and currently manages the workshop operations as well as the sourcing of rough from around the world. As with many of the ateliers spread about Idar-Oberstein, the frontage of C.F. Arnoldi revealed no indication of the riches that lay within. Upon arriving I was led to a small reception office where I was introduced to Alexander. It was soon evident that Alexander shared his firm‘s passion for coloured gems, as he enthusiastically brought out tray after of tray of perfectly cut gems. 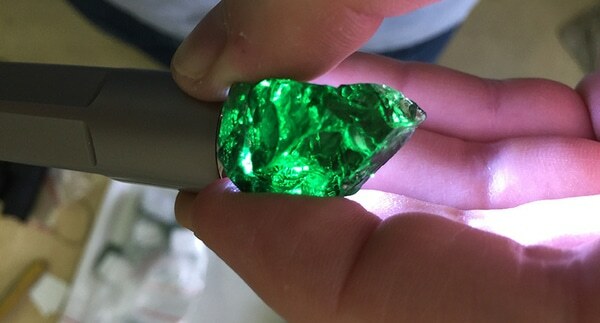 Having informed Alexander of our recent trip to the tsavorite mines of Kenya, he was particularly proud to show me a recently completed suite of tsavorites that took two years to produce. The largest of the stones was over 10 carats. Such a suite is extraordinarily rare and although the price tag made it attainable by few, I learned from Alexander several months later that the suite had sold quickly. C.F. Arnoldi prides itself in sourcing only the finest rough from around the world and cutting it to perfection in order to bring out the stones maximum beauty. After presenting me with other fine tsavorite and lighter green grossular garnets, Alexander introduced me to a new find of purple garnet, sourced from Mozambique, that the firm is marketing under the name of Royal Purple Garnets. This photo shows a beautiful example of this new material. At this time, Alexander took me on a tour of the cutting floor to show me how their gems are cut. onder the lapidary apprenticeship is so extensive! eg instead of the index faceter, Alexander explained that with their cutter‘s skill level, the time required to cut a gem with a jam peg was substantially less, without any loss of quality. The above photo shows the gemstone being preformed by hand. To the right is the dopping station where the gems are heated lightly using an alcohol flame to prepare the gem for dopping. The stones are sealed to the dop stick with a special lapidary wax. Once cooled, the cutter places the stick into the various specific holes in the jam peg and relying on his expertise fashions the finished gem! Our trip to Idar-Oberstein reinforced my huge appreciation for the fine craftsmanship of the German lapidaries. While searching the world for new varieties of gemstones and developing innovative methods to fashion them, their craftsman still hold dear the traditional methods, resulting in a fine, quality product that the world market desires. Special thanks to Alexander and Rene’ Arnoldi for their generous hospitality. This entry was posted in Uncategorized and tagged diamond appraisal, diamond mine, Idar-Oberstein.